One of the only perks of an early morning train ride is the 30 minutes I’m able to find for just myself. During this time, I usually just spend time in my own head, mentally preparing for the day ahead (or trying to master the art of sleeping with my eyes open) but today I felt like I needed some support and motivation. 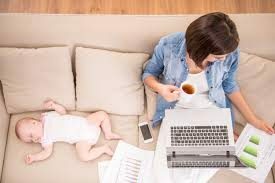 So I scoured the internet and found a ton of articles dedicated to working moms -specifically a ton of articles telling working moms how they can have it all, the entire dream. A fantastic career, happy children, a loving marriage, and time for self meditation or pampering or the gym or whatever it is the mother wants to do in her “spare” time – there’s nothing a working mom can’t do! Having been back at work for only the last month I feel like I can say with the utmost authority, that that is all a load of crap. Can we do it all? Can we try to manage our day to day lives to find time to dedicate to our careers? To our children? To our marriage? Don’t even get me started with to ourselves- I’m currently writing this as I try to balance myself standing on the train heading into the office. I mean technically, I am “doing it”. I am heading to work. I come home in the evening and find my daughter happy and healthy. I have a husband that I truly love. And yet, I don’t feel like I have it all. Being a working mom comes with a lot of compromises and it’s not ones I would’ve chosen to make. First of all being a stay at home mom wasn’t in the cards for me. When you manage to own a place of your own in New York, more often than not, there are two incomes that are needed to make sure that roof stays over your head. Add in the health insurance that is covered by my company for my entire family…my chances of staying home are 0%. So I gratefully took my 4 months of maternity leave, thinking it would feel like forever, when in reality I was just starting to get my bearings about a week before I had to head back to the office. Somehow, 4pm rolls around and it is time for me to get home. No, I do not get to leave early as many people like to point out as I get my coat on. I was up at 5:30am feeding the baby, in the shower by 6am, dropping off the baby at 6:50am, on the train by 7:15am and then in the office by 8am. I was thankfully able to negotiate (yes, I had to negotiate) an 8am-4pm work schedule, so while I made get comments about working a half-day – I’ve been in the office working at least an hour or more (cause let’s be serious, who really gets to work at 9am anyway.) Anyway leaving at 4pm means I get to be in my neighborhood by 5pm. I then have to go pick up the baby and depending on the mood she’s in, try to put her down for a quick nap or try to entertain her, while also trying to figure out how to get dinner made before my husband gets home around 6:30pm. If I’m lucky the kitchen will already have been cleaned up prior to me having to cook, but despite my best cleaning efforts the night before, dishes and glasses and pots somehow end up in the sink again, even when I’ve “closed down the kitchen” for the night. So at 6:30pm, my husband gets home and while I used to enjoy a leisurely dinner, I now have to scarf down my meals cause chances are baby girl is starting to get fussy, as she does when it gets close to her feeding/sleep time. So we eat quickly, leave the dishes as they are, and start getting her ready for bed. This can either mean a “quick” bath or another few minutes of play time before it’s time for her to eat and fall asleep by 7:30pm. 7:30pm is still early though isn’t it? That gives me plenty of time to do things I want to do for the rest of the night….right? Well, maybe once those dinner dishes we deserted on the table get washed. And after the kitchen gets cleaned up again. And after the garbage gets taken out. And maybe I can find a couple of minutes to clean up the living room. And you know, the laundry is piling up so I should probably try to get a load down now before our neighbor decides to do their 4th load of the day (we live in a coop and have to share the washer/dryer with our floor.) So maybe I can finally sit down around 9/9:30pm and spend some time with my husband, which lets be real, at this point is us spending time on the couch trying to find a show to watch that will allow us both to veg out and try to relax for an hour or so before we have to feed the baby again and then get ready for bed ourselves. So technically I do have it all. I have my job, I have my family, but I am not as committed to either of those things as I’d really like to be. I do my best to focus on my work between 8am-4pm, and maybe I’ll get into the grind of things and find time to really focus on my work,but then one call or text will send me down another road. Did I mention my baby learned how to roll over both ways my first week back at work? And it wasn’t recorded by anyone? You don’t realize how much you’re going to be affected missing those moments until it actually happens and then you spend so much time thinking about the rest of the milestones your going to miss while your at work. And then when I am finally home with her, I only have a couple of hours I can spend with her, but even that is shared with work around the house that needs to get done. I mean, we can’t order take out every night. Sometimes we will, because she’s being fussier and needs more attention, and honestly I’d much rather spend that time easing her and reminding her who mommy is and how much I love her, but realistically, I need to cook most night and I can’t spend those last couple of hours rolling on the floor with her and her toys. And my husband? Well, at least we cuddle most nights. And by cuddle, I mean I collapse near/on him in absolute exhaustion as I pray for the baby to sleep through the night, or at least until my alarm goes off in the morning for me to do this all over again.